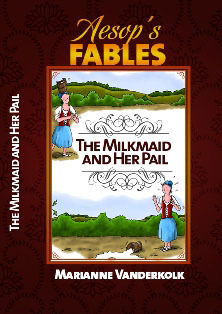 Are you looking to create a study around The Milkmaid and Her Pail? This ebook contains colourful bordered illustrations, lined pages, the fable ready to be traced to learn print or cursive writing. •An Outline of the approach to this fable; this includes Discussion Questions to help the teacher bring out the elements of the fable and help the child identify the writing techniques found in the fable. •Language Arts Lesson Plans based on Fables - A Step by Step guide to teach descriptive writing based on the model of any fable. ◦Printing and cursive handwriting worksheets which your child can trace over or write on to the illustrated copy of the fable. ◦Beautiful illustrations of the Fable. ◦Pages with a coloured illustrated border. ◦Pages with black and white illustrated border for your child to colour in. •Story Map graphic organizer for plot summaries. •Extra information on Descriptive Writing and useful Graphic Organizers.